Heritage narratives incorporate a struggle over the inclusivity of the past. In the UAE, this struggle is heightened by the country’s relative youth and individual emirates’ historic rivalries. The emirates’ historical autonomy has given rise to a series of interconnected and overlapping – but not identical – interpretations of the national narrative. The decentralisation inherent in the federal system of the UAE permitted the persistence of a multi-vocal understanding of national identity that varies between emirates. The emirate and federal governments mobilise the key components of nationalism – shared past, language, religion, etc. – to create a sense of loyalty and particularity for both federal and emirate-level narratives. The flexibility of the federal narrative which was once described through clichés of ‘unity in diversity’ or ‘unity in fragmentation’ are becoming more complex, dynamic, and, ultimately, unified. The passage of time and the coming-of-age of generations who do not recall the era before 1971 as clearly as their elders, have impacted the ways that the national narrative is conveyed and interpreted. The creation of new museums and the emphasis on Emirati unity in the vision documents suggest a new purpose and direction for the heritage narrative of the UAE. In my contribution to Cultural Heritage in the Arabian Peninsula, I argued that distinct Emirati narratives exist which make use of the federal narrative, but ultimately tell a story that is unique to their specific emirate. In my examination, I looked at pearling museums and museum exhibits in Sharjah, Dubai and Abu Dhabi. In these exhibits, I found emirate-level variations on the national narrative. The Dubai Museum in the Fahidi Fort for instance, emphasised the linked experience of pearling – diving and trading. In Sharjah, pearling occurs in a number of museums, but mostly in the Maritime and Heritage Museum. 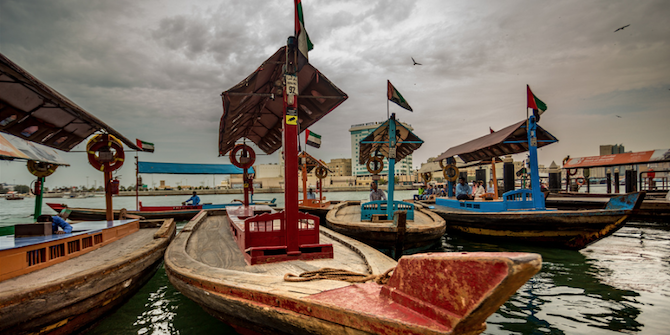 In the Maritime Museum, as in Dubai, trading and travel are emphasised alongside the actual work of diving. This is in stark contrast to what was observed in the Al Ain National Museum or in the Abu Dhabi Heritage Village. In both of these, a discussion of tools and the act of diving are emphasised, far above the trading links. While this could be easily explained as an oversight or in terms of access to materials, it is also important to note that trade is not traditionally considered an integral part of Abu Dhabi heritage narratives. We are in an era where a second-generation heritage narrative is being created through new museum projects and the incorporation of heritage into the national vision documents. Although a unified narrative has always been the government’s goal, the most recent wave of heritage interests has had a marked effect and we can see this in the vision documents. For instance, UAE Vision 2021 includes provisions for expanding many sectors of government and promoting a ‘cohesive society and preserved national identity’. It affirms that the UAE is ‘an ambitious and confident nation grounded in its heritage’. The UAE Centennial 2071 Vision will create a pathway for the population to create ‘social cohesion’ and instil an ‘Emirati moral values system in future generations’. These documents hint at a coordinated national identity narrative. Similarly, other heritage projects reflect harmonisation. For instance, Abu Dhabi’s narrative has begun to adopt elements of the Sharjah emphasis on culture and heritage. In the Saadiyat projects, many are linking themselves not only to the distant Emirati past through the archaeological sites of the Abu Dhabi emirate, but also to the wider Middle East by hosting traveling exhibits highlighting the culture and heritage of the region. Their emphasis on tourism and spectacular structures shows influence from Dubai’s approach to development. In Dubai, the investment in museums and in historic programming illustrates its interest in the overall heritage narrative and its reaction to criticisms that it is all flash and no substance. It is not only these emirates that are buying in to this new goal. In Um al Quwain, its Tatweer plan focuses on building the general economy, heritage, infrastructure and public sector. This emphasis on heritage shows the influence of the Vision 2021 and Um al Quwain’s desire to be represented by it. It is important to note that the goal has always been a unified national narrative and the result has been a series of interconnected, yet not identical versions of that national narrative. It remains to be seen whether this rhetoric will actually yield further coordination. Recognising diversity within the national narrative and understanding how it is building towards unity is an important first step towards achieving the goals of the vision documents. The vision documents and the new heritage projects suggest there is room for coordination and for specialisation, yet, there are many questions that remain in the overall. To what extent does the existing narrative resonate across the different emirates with Emirati citizens? What will the shift to intangible heritage do to the national narratives? How will the approach to ‘modern heritage’ impact the significance of earlier heritage narratives? Will the heritage of the mid-20th century be preserved or eliminated as the quest to solidify the deeper past? My assessment of the historical narratives of the UAE is we are in the midst of the second generation of heritage narrative creation. It remains to be seen what the result of the renewed emphasis on coordination will be, but the vision is for a unified future. Victoria Penziner Hightower is an Associate Professor of History at the University of North Georgia in Dahlonega, Georgia, USA. She has published articles on the history and heritage of pearling in the United Arab Emirates and has co-edited a volume entitled Representing the Nation: Heritage, Museums, National Narratives, and Identity in the Arab Gulf States.